The Wine Tourism Conference is pleased to offer additional learning opportunities outside the regular conference Agenda. 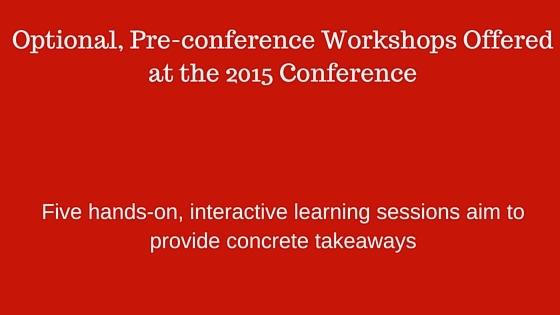 This year we have five, optional pre-conference Workshops on Wednesday, November 18. 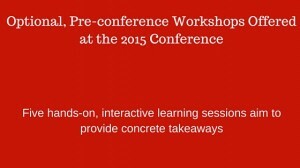 Pre-conference Workshops represent interactive education in a smaller environment. The Workshops are available to all conference attendees AS WELL AS non-conference attendees. You don’t have to be registered for the conference to participate in a Workshop. Crunched for time this November? Consider joining us at a Workshop! New to this year: beer-industry specific Workshops that meet the business and marketing demand of the blossoming craft beer movement that is also happening in Loudoun County. This year’s Workshops are geared towards wineries and breweries and any business involved in wine and/or beer and, specifically, winery tasting rooms and wine, food, and beer tour operators (or those that aspire to start a tour company) and anyone who markets on the web (99.9% of all involved in wine + tourism!). Workshops are offered in the morning (two to choose from) and afternoon (three to choose from) on Wednesday, November 18. Digital marketing is easy to target to specific demographics, easy to track success, and often more cost effective than traditional advertising. This session will provide an in-depth look at digital marketing for the wine industry, including search engine optimization, content creation, social media, email marketing, online advertising, and video marketing. The workshop will be led by Nicole Skuba of BlueTreeDigital with wine industry expertise added by Gary Nealon of Wine Trail Adventures, whose specific expertise is using digital marketing to increase sales. Beer Tourism is just coming into its own but it is doing so quickly and powerfully. The rapid growth of breweries has been driven by the rapid growth in craft beer consumption and these two factors are driving the growth in beer tourism. And visitation to breweries is not only extremely important for the financial success of many small breweries, it also affects the local economy by filling beds and restaurant seats. “Beer tourism” has many levels, ranging from simply visiting a local brewery for a pint to seeking out the local brewery while on vacation to actually planning a trip to visit breweries to even joining full-fledged beer vacation tours. This workshop will discuss all aspects of beer tourism, with a focus on increasing visitors and improving experiences at the brewery level and promoting a region as a good place to visit for beer tourism. Our panelists include Mariah Calagione from Dogfish Head brewery; Virginia Brewers Guild Tourism & Marketing Committee Co-Chair Kevin O’Connor from O’Connor Brewing; and Tommy Miller of Richmond Brewery Tours. Tasting Room Management is not only extremely important but also very complex. Tasting rooms not only are key to selling wine from the “cellar door” but they are also often the first impression given to potential customers about a winery. How you organize and manage your tasting room will have a definite affect on sales both on the spot and in the future. This workshop will cover all aspects of tasting room management, including setting hours, deciding on whether to require appointments, layout, staffing (hiring, managing, and training), pricing, selling, and gathering wine club members. Tasting room expert Elizabeth Slater from In Short Direct Marketing will run the workshop. If you are interested to start a tour company or wish to grow the one you already started this is the workshop for you! You will learn from four established tour operators about selecting a niche, identifying your target market, marketing, insurance, employees, and more. In addition to presentations by established, successful operators this session will include significant group discussion as we share ideas, talk strategies, and make friendships. The discussion will include details of and be relevant to tour operators in the food, wine, and beer industries, which have many similarities but some differences. Our panelists include Jeff Swedarsky of Food Tour Corporation, Tommy Miller of Richmond Brewery Tours, Kristina Bouweiri of Reston Limo, and Jane Gregg of Epicurean Ways. The craft beer industry is in an enviable position, with rapid growth in terms of breweries and beer consumption. Because of this, many breweries are more focused on producing good beer than they are on selling it. Nevertheless, wise industry participants are engaging with their customers and marketing to new ones via the Internet. This session will provide an in-depth look at digital marketing for the beer industry, including search engine optimization, content creation including blogs, social media, email marketing, online advertising, and video marketing. The workshop will be led by Nicole Skuba of BlueTreeDigital with beer industry expertise provided by Neal Stewart, Vice President of Marketing at Dogfish Head brewery. Workshops are $125/each and there is a price break if you register for two ($200). If you are already registered for WTC15, you can register for a Workshop via this link. If you would like to register for the conference + Workshop/s, please use this, separate link. The 2015 Wine Tourism Conference Agenda is robust; the location at the Lansdowne Resort in Leesburg is awesome (just 25 minutes from the Washington Dulles International Airport! ), and our conference Partners are fantastic. We look forward to seeing you in Loudoun County, Virginia this November 18-20 for the 2015 Wine Tourism Conference!